Here's a wonderful late summer early fall dish that is the lunch special at my restaurant this week. 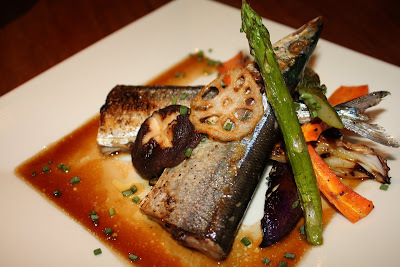 This is a grilled Sanma(mackerel pike in English) served with veggies, lotus root, and a yuzu shoyu (soy) sauce. Healthy, low carb, flavorful. (if a bit high in sodium). This is a really tasty, healthy dish. Served with 5 grain rice this one is perfect for the changing seasons. Yum. What's cooking at your home or favorite restaurant?